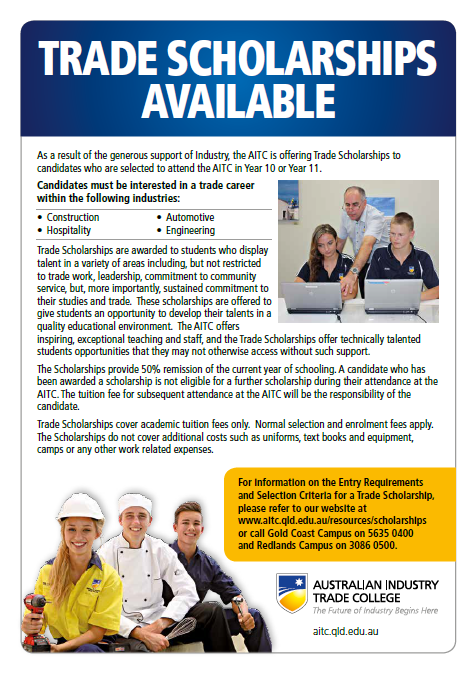 The AITC Gold Coast and Redlands campus are offering Young People currently in Year 10 and Year 11 the opportunity to apply for scholarships in 2019. Young People across all trades and traineeships are now eligible to apply. For a list of all trades and traineeships currently available please visit the A – Z of apprenticeships and traineeships at www.apprenticeshipsinfo.qld.gov.au.